The Recreational program provides a non-competitive environment for players to develop skills and an appreciation for the game of soccer. Emphasis is placed on FUN and fundamentals. It is available to interested players age 4 - 18. 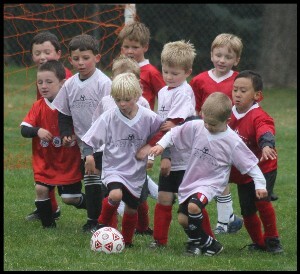 Arsenal Colorado / Mighty Kicks (3-4 year olds) CLICK HERE. There are 2 seasons (spring and fall). Each season runs for 8 weeks. **We recommend that you know your login and password for GotSoccer before you begin the registration process. If you do not already have an account created, you can create one before registration opens. If you remember your login from previous season: Proceed to online registration (link above). Use the SAME logins that you made last year so that duplicate accounts don’t occur. If you DO NOT remember your login: Navigate to www.gotsoccer.com, select User Login (upper right corner), select Players and Families. Click on the link that says “Player account lookup" Here you can put in the email address that we have on file. You will then receive your login information via email and can then proceed to the registration! If this is your first time registering: go to www.gotsoccer.com select User Login (upper right corner), select players and families, create a new INDIVIDUAL PLAYER ACCOUNT. Then you will need to CLICK HERE to complete the registration. Youth Recreational Registration is available online, in the office, and by mail. It is important to understand that recreational age groups are different than competitive age groups. We want recreational players to have the ability to play with kids in their school grade. However, competitive teams (including PDL) will have to follow state and national mandates and play with kids who were born in the same year. Teams will formed based on gender, age and school. Teams will be formed based on school preference with combined teams formed as necessary based on school geography and player numbers. Players will be allowed to play up one age group in order to align with future PDL or competitive placement and other reasons with staff permission. Players can play down but ONLY if they are playing grade appropriate. Roster sizes for teams are: Pre-K (U5) age group plays 3 v 3 (roster size 6); Kindergarten and 1st grade (U6 & U7) age groups play 4 v 4 (roster size 7); 2nd, 3rd, and 4th grade (U8-U10) play 7 v 7 (roster size 10); 5th/6th grade (U12) play 9 v 9 (roster size 12); 7th/8th grade (U14) play 11 v 11 (roster size 15) and high school (U18) play 11 v 11 (roster size 15). Players have the opportunity to request a coach (not guaranteed) and to request a player(s) (not guaranteed) they would like to be placed with. Please recognize it is not possible to honor all requests – priority will be given to players who request to return to their team from the previous season.